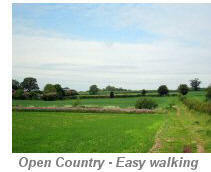 An very enjoyable walk with no stiles, along quiet lanes. Mostly flat through some attractive woodland, open countryside, and a section of the Grand Union Canal. Suitable for dogs. 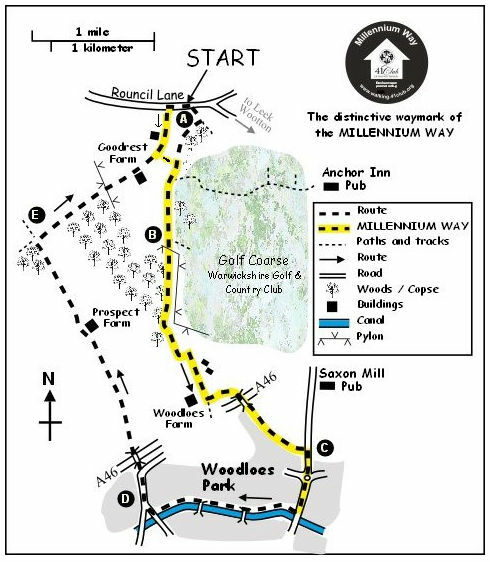 The walk incorporates sections of the Millennium Way, where you will be guided by the distinctive black Millennium Way way markers. Find out more about the walk by clicking on the information icon. Park in the lay-by on Rouncil Lane. Take the footpath at the end of the lay-by, go through the kissing gate, and continue across field to take waymarked gap ahead into woodland. Once through the gap turn immediately right onto woodland footpath, after 30 paces pass a way post marked Centenary Way. Continue along woodland path eventually to cross small stream via wooden bridge as you approach a golf course. Bear slightly right to stay along the path with golf course left. Soon you will arrive at a metal kissing gate. Take gate and bear left to a way post then continue ahead keeping hedge left. Do not take path left on to golf course. Here you have joined the Millennium Way where you will see the distinctive black Millennium Way way markers which will guide you for part of the route. Stay ahead keeping hedge left. Continue on to take kissing gate into a large field. Stay ahead keeping hedge and trees left eventually to find an old wooden gate. Pass by the wooden gate and stay ahead. Ignore mid hedge kissing gate/path left and go with hedge left under power lines along winding narrow path to take take metal gated gap into wood. Follow woodland path to emerge onto golf course on left. Stay ahead on track keeping hedge and trees right and pylons left. 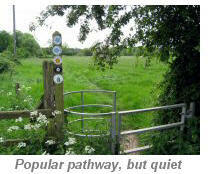 Go through hedge gap and stay on narrow track along edge of fenced field to find metal kissing gate. Take gate and continue directly ahead passing large mound and houses left. On entering open field go slightly left to pass under power lines with Woodloes Farm on right. At the junction with metalled farm track turn left and follow track to junction with lane. Go right on lane and follow over A46 (Kenilworth Bypass) to arrive at main road (A429). (At this point if you wish to visit the Saxon Mill at Guy's Cliffe go left on main road) otherwise go right on road to continue the walk and go directly across a large roundabout staying ahead to come to a canal bridge. Just before the bridge take path right to join towpath. (Here we leave the Millennium Way). Turn right on towpath keeping the canal on left. Stay along towpath under bridges 49a and 49b. When you reach the next bridge (No 50) just past a large block of apartments, leave the towpath and go right up some steps to reach the road. Turn right on road to reach T-junction (Wedgnock Lane)and turn right. After a little way, just before road swings right, cross over and go left up surfaced cul-de-sac signed Prospect Farm & Barn. At the rise you will cross the bridge over the A46. Stay along the private lane and when you reach a junction ignore road right and stay ahead walking gently uphill towards Prospect Farm. Continue past farm and a couple of small attractive cottages on your right. Stay ahead on lane until you come to the far end of a wood on left. Here you will find a way post with several bridleway way marks. Turn right here through a large wide metal gate and go along edge of field with hedge and trees left. Stay along field side track to pass through another large metal gate. When you reach the end of the track go left through large gated gap and stay on same line but now with hedge and trees right. Stay ahead with hedge right passing under power cables then through a metal gate towards farm buildings. Keep to left of farm building to find metal gate on right. Take gate to surfaced track and bear left to continue along the farm track. After approximately 100 yds you will come to a kissing gate right. At this point the Millennium Way rejoins our route. Ignore gate and stay ahead on farm track to road. Turn right on road and after a short distance you will arrive back at your starting point. 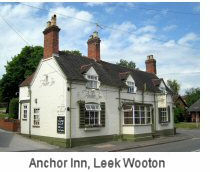 A short drive back into Leek Wootton will take you to The Anchor Inn for refreshment. 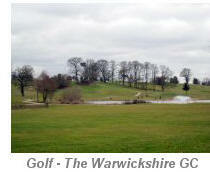 Across the golf course, towards the village, the manor can be glimpsed. Woodcote is a 19th century manor house and estate in the village. During the Second World War it was used as a convalescent home for military personnel, notably American servicemen. It was home to the headquarters of Warwickshire Police from 1949. A new purpose-built headquarters for the Warwickshire Police at Woodcote was proposed, but the planning application was refused by Warwick District Council. A revised application was subsequently approved, but the site was not redeveloped. In 2011 it was announced that Woodcote was to be sold, and the headquarters relocated to the new Criminal Justice Centre in Leamington Spa. 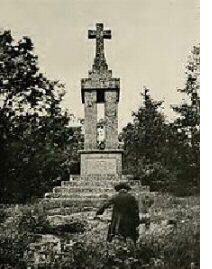 The monument Gaveston's Cross is located on a site south of Leek Wootton (unfortunately on private land). It marks where Piers Gaveston, 1st Earl of Cornwall was murdered. In 1308 Edward II travelled to Boulogne to marry Isabella, leaving Piers Gaveston to act as regent. Resentment against Edward's rule and Gaveston's position grew, some barons began to insist Gaveston be banished. Edward could do little to prevent Gaveston being captured in 1312 under the orders of theEarl of Lancaster. He was captured by the Earl of Warwick, whom he was seen to have offended, and handed over to two Welshmen. They took him to Blacklow Hill and murdered him; one ran him through the heart with his sword and the other beheaded him. The mill was originally called Gibbeclive Mill in the 12th century. It was the property of St Mary's Abbey, Kenilworth until the Dissolution of the Monasteries. It was rebuilt in 1822. It was a working mill until 1938, and it was converted into a restaurant and bar in 1952. The restaurant has a glass window cut-away in the floor where the water can be seen flowing under the building.